This challenge fund supports projects aimed at improving conditions of vulnerable workers in the ready-made garment (RMG) production sector, funded by Ukaid as part of the Department for International Development, for more information please visit their website. The aim of RAGS is to make responsible and ethical production the norm in the garment manufacturing sector supplying the UK. RAGS is currently supporting 12 projects across four countries: Bangladesh, India, Nepal and Lesotho. Since the start of our RAGs projects in May 2011, People Tree has stepped up its work on Capacity Building for Fair Trade producer groups and workers in Bangladesh and Nepal making garments.The evaluation of our progress will be in May 2013. The producer partners we are working with five Fair Trade partner organisations Devtech, Artisan Hut, Kumudini Welfare Trust of Bengal (BD) Ltd, Thanapara Swallows Development Society, (based in Bangladesh), and Kumbeshwar Technical School (KTS), in Nepal. 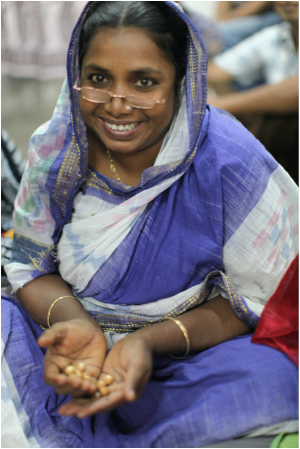 The tools that are developed will be used to strengthen other Fair Trade groups in People Tree supply chains and much of the learning's will also be used for handicraft groups in Bangladesh. 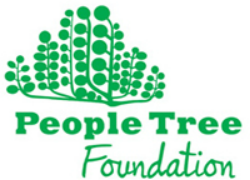 WFTO has also accepted People Tree as a pilot for the new Fair Trade product label. We plan to achieve this within 2014. In the Rags project, there are five producer groups, each with respective sub groups. Details of these and the skills they provide are below. 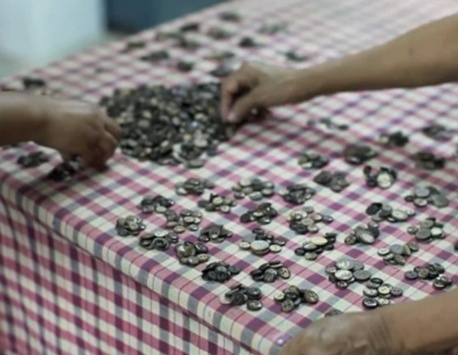 Every producer in all the partners at the start of the project took part in an activity to measure how their organisation was doing against the WFTO the ten standards of Fair Trade, click here to watch our video about the process of embedding the ten WFTO Fair Trade Principals. Enabling People Tree to take gain feedback from the producers on how they felt we are doing. The producers ranked their own organisation against the ten standards using counters to vote anonymously. At the end of this exercise the ranking of which standards the workers think are done well and which they think are not will form the basis of the action plan. Structural improvements have been made to facilities e.g toilets and floors of workshops. Key documents were translated into Bangladeshi and Nepali and were distributed and displayed in the appropriate language. These included the Bangladesh Factories Act, WFTO ten standards and the Minimum wage info has been an important part of this process - you can download all these documents here. Issues identified included the rates of pay for the women working on winding the bobbins. The Bangladesh minimum wage was translated into the local language and displayed in all the workshops. In October 2012 we went back to the producers and interviews verified that the women are now being paid above the minimum wage, and how the increase that they have received came about. The aim with Fair Trade is that everyone in the supply chain is paid above the minimum wage. In order to calculate wages and hours a workbook has been designed, printed and is being used by everyone who makes People Tree products. This is to register their hours, overtime holiday and sickness. This happens in Bangladesh and Nepal. The improved storage and labelling of dye materials has ensured that not only that chemicals are stored safely, but also that less are used which saves money and good for the environment. We have worked with local and international engineers to specifically design a waste water effluent plant for each group in Bangladesh. Going forward the use and disposal of chemicals and water is seen as a problem and we are researching the best and most appropriate methods for waste water treatment. 3. To improve delivery time – so far this has been brought forward by 4 weeks. Three of the groups in Bangladesh have been supported to purchase their single yarn together, this is then twisted in one place. This has led to improved quality and delivery for the last three seasons. This has been supported by the People Tree team committing to fabric quantities before the final orders are placed, giving long lead times to the producers leading to less quality errors due to rushed production. This is now being rolled out into the non RAGs partners too. 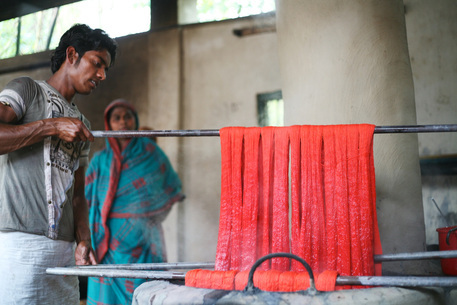 As a result of workshops given by People Tree staff, producers involved are now expert in using azo-free dyes. In Bangladesh all the groups have been part of continuous training programmes, including pattern cutting, tailoring, dye improvement, quality control and production management. The photo opposite shows a People Tree designer in the field in en embroidery workshop. This has resulted in the quality of the garments produced improving, less waste materials so greater efficiency in all the workshops and in three out to the four producers have continuous improvement their QC rejection rates during the project. 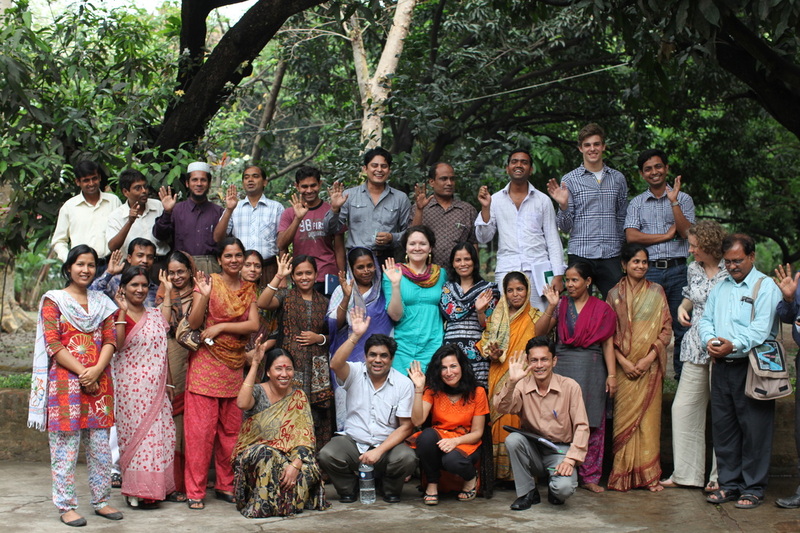 People Tree has funded some master pattern-cutters to run workshops for other Fair Trade groups around Bangladesh. Each of the partners has worked with People Tree to expand their customer base. With visits to the Uk by all the project partners. The Market Exposure Programme gives partners an opportunity to meet customers and learn about their needs, visit shops and do market research to understand the competition and opportunities, visit distribution centres to learn about logistics, and also work with the People Tree team to upgrade skills. Photographic and video materials are taken to be used by them on their return, to share their experience and make an action plan with their group members. With visits to the UK by all the Fair Trade groups.